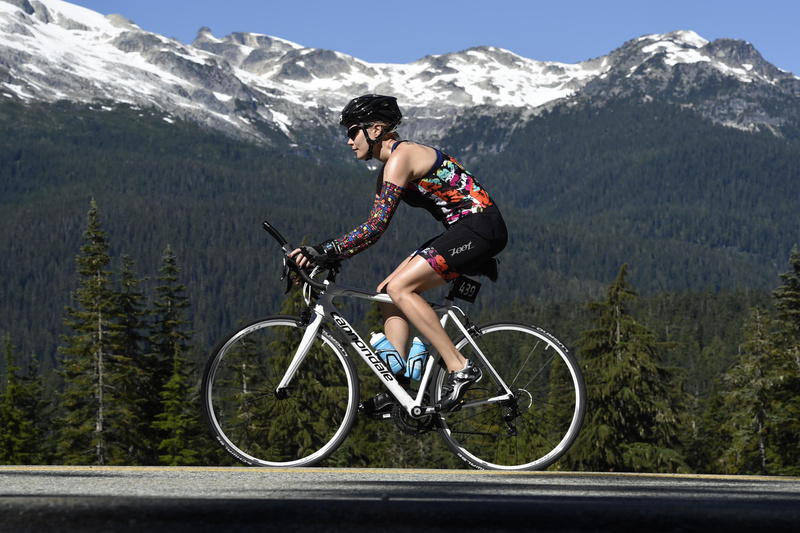 Just a few days out from Ironman Canada, I’ve been able to reflect on the 14 hour and 55 minute experience I had out in Whistler, Canada. Situated in the home of the 2010 Winter Olympics, I expected nothing less than a beautiful setting for my first Ironman; a setting that saw over 1400 participants toe the line for the full 140.6 distance (2.4km swim, 180km cycle and 42.2km run). So – be warned. If you’re looking for a first-time Ironman course, this one’s tough. 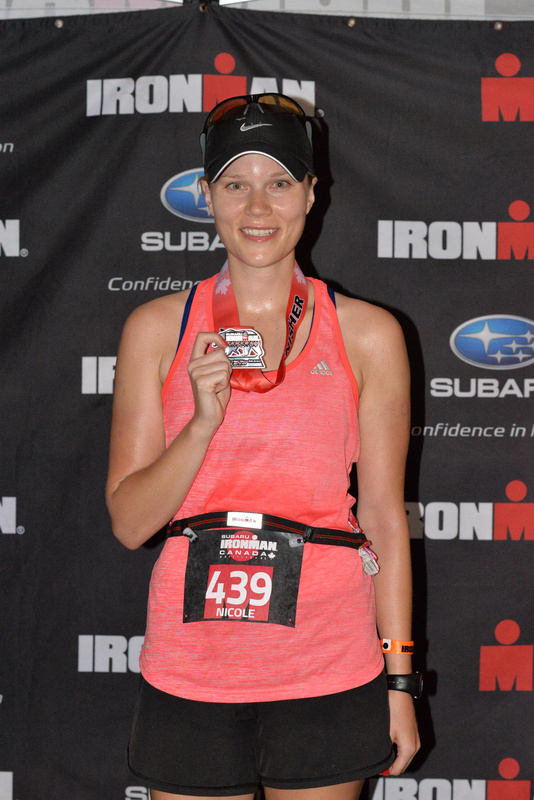 Though, really – any Ironman is a pretty darn good challenge. With this being my first full Ironman event (I completed Victoria 70.3 one month prior) the experience of bag drops in two different transition locations was new to me. 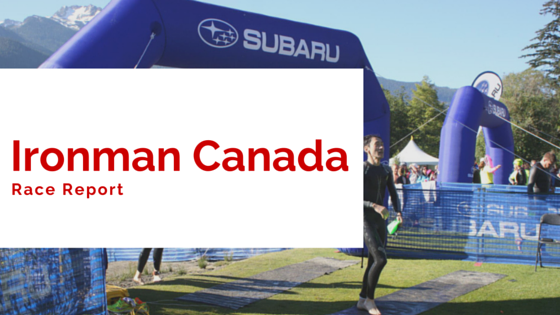 At Ironman Victoria 70.3, both T1 and T2 were in the same location, making race morning easy. With Ironman Canada, bike drop and bag drop were on the day prior to race day. Looking back, this made race morning much more simple as all I need to remember was my nutrition, wet suit, goggles, swim cap and my trusty race legs. It was also my first time packing special needs bags. Special needs bags are bags that you receive half-way through the bike and half-way through the run, and are only available on full Ironman events. Basically, they’re life-savers and even if you don’t think you’ll need nutrition or aid at the 90km or 21km marks of your race, do it. It doesn’t hurt to prepare just incase. Surprisingly, I think my support crew was more nervous than I was on the morning of Ironman Canada. Some members of my crew were out of sorts all day, while others couldn’t sleep the night before. Me? I felt calm and rested. I knew I could handle the day ahead and I knew I was ready. If something were to happen on the course, I was content; I had pushed hard to this day and I was comfortable letting fate take its course. Over 1400 of us slowly made our way into the water in wave starts. On the first loop, I focused on keeping my breathing calm and my swim stroke smooth. As it was a two-loop course for the 2.4-mile swim, my strategy was to take the first loop “easy” to get my body adjusted, and push on the second loop. This worked out well, as I was certainly more aggressive and hugged the buoys on the second loop. 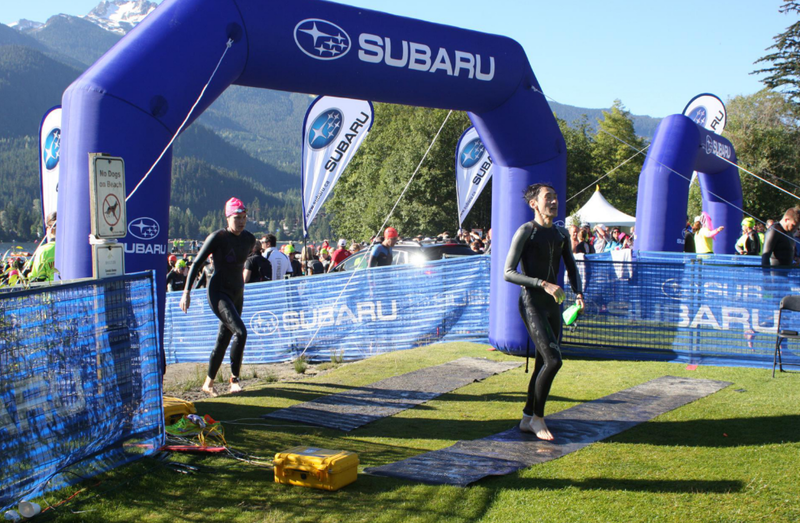 Coming out of the water, I was met with wet suit strippers and quickly made my way to transition. Here’s where it really got fun. I had studied the course for months, and I was lucky enough to train on part of the course, so I knew what to expect. With an elevation gain of 6885 ft, the course was technical for road racing, as there were plenty of climbs and descents to focus on. Biking out to Callaghan Valley, site of the Nordic skiing events during the 2010 Olympic and Paralympic Winter Games, riders experienced the first real climb of the day. A quick descent led us back to Whistler Village and onto Pemberton, where I hit speeds of 60km/hr on the downhills. The descent into Pemberton is real, and knowing that you need to climb back to Whistler as of 150km was the most intimidating part of the day. Fast-forward to about 50km of flat riding, I had purposely saved plenty of leg strength for the final 30km. The climb back into Whistler is unlike any ride I’ve done. It’s unrelenting; the climb does not stop, and there is literally no reprieve for 30km. The day was quite warm, reaching about 29 degrees Celsius on the way back to Whistler, so this is where participants started to drop. With paramedics placed in this last stretch of the bike course, Ironman Canada was prepared for the unknown. My strategy for the ride was to push my speed in the first 150km, but save enough legs to climb in the last 30km. I was riding at about a 25-27km/hr pace until this climb, and my overall speed dropped to 23km/hr with the climb. Advice: Train on hills, climb plenty of mountains and know how to save your legs for these long rides. Within the last 5km back into Whistler, I increased my cadence as I started to prepare my body for the marathon leg of the event. To be perfectly honest, my mind shut down during the run. My strategy here was to run the entire marathon and walk through the aid stations, which I did, but my mind turned off completely. I told my legs it was time for them to take over, and I only really paid attention to the course and event when I saw friends and family holding signs and showing their support. It’s a funny feeling letting your body take over and having your mind shut down (one that I’m thankful for, because it’s one long run). The run course had its fair share of hills, especially in the first few kilometres as we climbed to Lost Lake. As a two-loop marathon, I enjoyed getting familiar with the course the first time around, again knowing when to push through the end. It was at this point that my stomach started to show signs of wear, as I couldn’t keep nutrition down after the 15km mark. I turned to on-course nutrition in the form of pretzels and grapes (life savers) and touched only two gels throughout the marathon. The best part of the day, and a memory I’ll have forever. It had just turned dark by the time I saw the infamous red and black mat, and I was so thrilled to finally be there. I felt strong crossing the finish line, quickly spotting my friends and family at the end of the gate. They had tears, I had tears (mixed with sweat, sun screen and goodness knows what else). Admission: I suffered dehydration in the last few hours (that’s why I couldn’t keep nutrition down) and had a rough night following the race…though that didn’t stop me from popping champagne before bed. Overall, I highly recommend this event for anyone racing Ironman. If you’re a beginner, just know that it’s a tough, hilly course, but manageable if you train and race smart. NICOLE IS BASED OUT OF VANCOUVER, CANADA. Email me below or connect with me on social.